Mary was thoroughly frustrated. “It took me six hours to get travel insurance,” she commented. And all because her husband, Graham, had just had his 90th birthday. As if that stopped them from wanting to fly to far-away places or to go sailing on the high seas this summer. 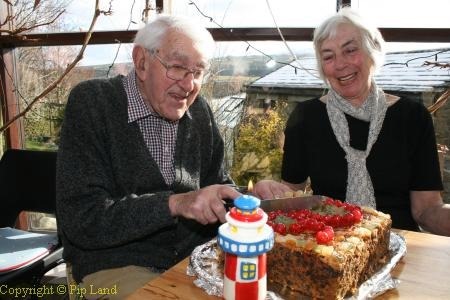 They sailed around the world – just the two of them – in a 36ft steel boat when Graham was 73-years-old. The two years spent meticulously researching that journey helped him come to terms with retiring when he was 70-years-old. By then he and Mary had lived and worked together for nearly 35 years. The Complete Farmhouse Kitchen Cook Book, that Mary edited from recipes sent in for the cookery series they created for Yorkshire ITV in the 1970s is still getting five star reviews on Amazon. Mary, who originally trained as a typist, began her career in commercial television in Australia. After moving to England she worked her way up from being production assistant and secretary to the Religious Advisory Committee at Yorkshire TV to being a researcher and then the producer of the cookery programme of which Graham was the director. “It was our programme really from start to finish,” Mary said. It became very popular because it showed people how to make good, decent nutritious food economically. They started that programme about the time that they got married and bought Gaudy House near Hawes in Wensleydale. “It was without electricity, without telephone and without TV unless we ran a cable from the battery in the car,” Mary remembered. They sold Gaudy House in 1999 and moved a few miles across the dale to a house in Askrigg. Graham’s career began inauspiciously as he left school with no qualifications. He did, however, have a great interest in radio and his father got him to apply for a job at the BBC in late 1940. After a short while with the BBC he joined the radar section of the Army’s Royal Electrical and Mechanical Engineers. At the end of the war he worked with the Forces Broadcasting first in Germany and then in Sri Lanka. He rejoined the BBC in 1947. When ITV started he joined Rediffusion TV, the first commercial television company in Britain and by the time he was 30 he was a programme director. He thoroughly enjoyed producing and directing a wide range of programmes, including outside broadcasting, of major events, coverage of Budgets and planned the entire ITV set-up for Winston Churchill’s funeral. He regularly worked 12-hour days seven days a week. “I don’t think I have ever worked so hard,” he said about his early years in commercial TV – and added: “We enjoyed it all”. So, after they have visited friends and relations in Australia and New Zealand, they will be, with the help of friends, sailing to Norway, Denmark and Sweden where Bill, his son, makes films and has a family. Truly inspirational to all sailing and travelling couples! Graham Watts is my great uncle. He is the brother of my Grandfather Arthur Watts. Just shown my children Finley Watts age 4 and Matilda Watts a picture of their great great uncle!! I put them in contact with Graham and Mary and a family gathering will soon take place. A lovely lady called Evelyn Stevenson, who appeared on Farmhouse Kitchen with Graham and Mary, is in my WI. She has been county chairman and is still a great source of knowledge for fellow members, as well as being a wonderful cook. Now 90 (or 21 and many months, as she prefers), she talks fondly of working with them and tells me she is very keen to get in touch. Do let me know if that would be possible. Thank you. I have put them in contact with Graham and Mary. what a lovely article. Mary Watts produced a Morning Worship programme in the Leeds Belgrave Street Synagogue for Yorkshire TV (aired 1st Feb 1981) featuring my late father Rev David Katanka and Rabbi Dr Solomon Brown. Ever since my fathers untimely death a few years ago I have desperately been trying to find a recording of this wonderful service (I was present as a six year old). I was wondering if Mary would have a copy, or know or who would have one.